There is no better demonstration of the British love for an eccentric challenge than the well-trodden route between Land’s End and John O’Groats. The journey between what are almost the two farthest-flung points of the British mainland serves to illustrate both the nation’s long, skinny shape – 837 miles in a country where it’s impossible to be more than 70 miles from the sea – and also our collective love of a bizarre quest. The first recorded walking of the whole distance took place in 1871 and, since then, it has been done on everything from bikes to skateboards to lawnmowers to at least one traverse by JCB. In an outright win for toughness, the route has even been swum, adventurer Sean Conway spending 135 days covering the 900 mile route around the coast in 2013. 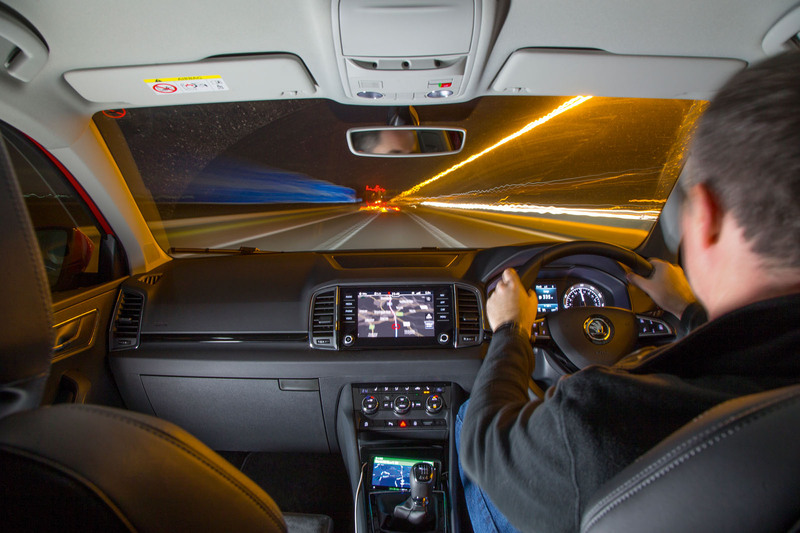 Driving is definitely the easy way, but although there have been some blisteringly quick private runs, the inability to close roads or evade prosecution means there are no official records in excess of the official speed limits. Our mission is subtly different and grander in ambition: to race the sun rather than the clock. 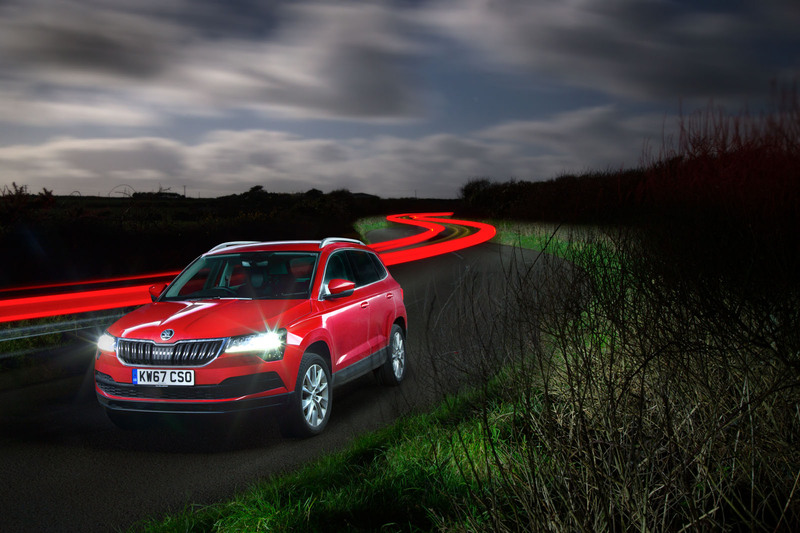 The aim is to show that the journey can still be a proper adventure without getting arrested, and even in a vehicle as unlikely as the new Skoda Karoq. A mid-sized diesel-powered crossover might not seem like the most obvious choice for a rapid end-to-end run, but this is a journey where comfort and fuel range are far more important than outright pace. It’s also the perfect opportunity to introduce what’s likely to become one of Skoda’s biggest sellers to the UK. The plan is to leave John O’Groats as the sun sets and reach Land’s End before first light the next day, a north-to-south run giving us fractionally more night. Attempting it in mid- December would have been too easy, but choosing the night of 1-2 February gives an almost perfectly balanced challenge, with 14 hours and 44 minutes of night for a journey that, Google reckons, will take 14 hours and 56 minutes with no traffic delays. Time isn’t the only challenge. The weather is determined to have a say, too. Snow is falling as I drive the Karoq north to meet snapper Stan Papior at Inverness airport, and by the time we reach the Seaview Hotel at John O’Groats, the TV forecasters are standing next to maps covered in huge arrows and warning of an approaching Arctic front. The wind is already topping the gale scale, blowing hard enough to make it hard to stand upright. Things have changed since I was last here, in 2007. 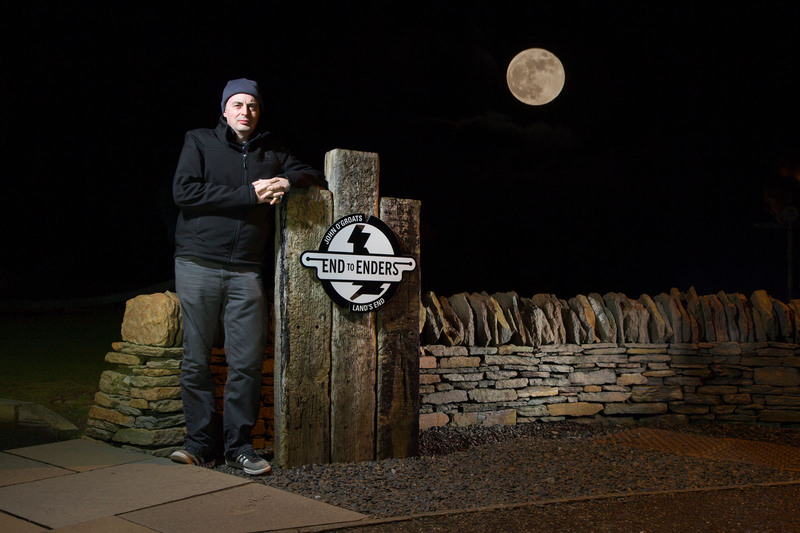 Back then, I did the same trip in my long-term test car at the time, a Citroën C6, to demonstrate its journey-shrinking abilities, and John O’Groats’ ‘end of the world’ vibe felt as much post-apocalyptic as geographic, the village’s eponymous hotel shuttered and seemingly at risk of collapse. Now it’s restored and surrounded by luxury chalets, the cafés and gift shops doing a respectable trade even on a bleak Thursday. The increasing popularity of the North Coast 500 has brought many more travellers during the summer – and a fair crop of supercars, to judge from the pictures in some of the businesses. There’s even a Starbucks franchise, where we kill a couple of hours waiting for the sun to set and watching the wind whip the North Sea. Sunset is an anti-climax, with no discernible difference in the gloomy greyness as 4:34pm rolls around and – somewhere far behind the clouds – the sun dips below the horizon. 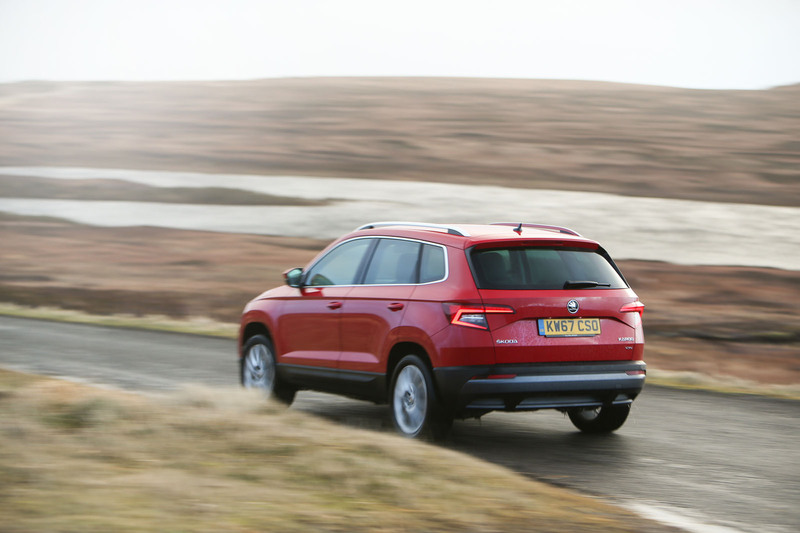 The sat-nav reckons there are 839 miles ahead of us and the Karoq’s trip computer claims a 500-mile fuel range. As we set off, it starts to rain almost horizontally. The drive to Inverness is more of a trundle than a sprint, the A9 following the rugged shape and swoopy contours of the coastline for the first hour or so. It’s spectacular, and twilight offers some good views of cliffs and moorland, but it’s definitely not fast. 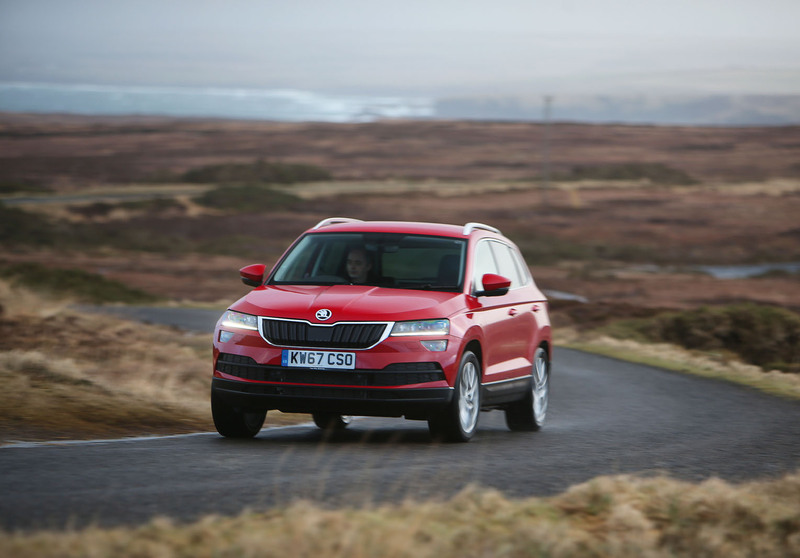 Skoda has wisely chosen to fit our Karoq with Bridgestone Turanza winter tyres, which are quick to indicate their lack of enthusiasm for higher speeds on the twistier sections. It’s cold and slippery out there and a nearly new Ford Transit, embedded in a fence, serves as a salutary lesson about the treacherous conditions. After twilight, the arrival of darkness reduces distractions, with the most noticeable being the sight of oil rigs far out to sea, brilliantly illuminated and with flare stacks blazing orange. Things are picking up in the North Sea to judge from the number of them, both at work and towering over the small town of Invergordon, where they come for repair and refurbishment. Although the Karoq isn’t mad on corners, it’s pretty good at straights, and capable of the sort of rapid but sensible pace necessary to keep on schedule in conditions like these. The long journey north to our official starting point has already proved it to be a fine long-legged cruiser, and although the 147bhp version of the familiar 2.0-litre TDI diesel doesn’t deliver scintillating thrust, it does have the doughty low-down torque that makes for relaxed progress. The manual gearbox is good, too, with a pleasingly precise shift action. The Volkswagen Group’s ability to stir its MQB porridge pot into different flavours continues to impress, the Skoda’s dynamic demeanour feeling bigger and more grown-up than its mechanically near-identical VW T-Roc and Seat Ateca cousins. Travelling by night was meant to cut down on traffic but we encounter a five-minute queue for roadworks that have reduced the bridge over the Cromarty Firth to a single lane. Progress stays slow and sticky until we pass Inverness, just a couple of minutes adrift of our bogey time, but with the rain turning to snow. At first, the flurries of flakes barely bother the Karoq’s wipers and the road stays reassuringly black. But as the A9 begins its steady climb towards Slochd summit, the fall gets heavier and starts to stick. Even with the Karoq’s four-wheel drive and winter tyres, the occasional stretches of passing lane are soon too white for prudent use and it’s not long before we’re grinding up the grade in a long line of cars and lorries, following distant gritting truck and with the speedo needle pointing at just 5mph. The sat-nav’s ETA starts to slip backwards, soon beyond the 7:19am at which first light is due to arrive in the far west of Cornwall. Not that Highlanders let a little weather stop them. The snow stops falling before we reach Aviemore, and although there’s a decent amount on the ground, the well-gritted road is soon clear again. My instinct is to try to claw back some of the lost time, but it needs to be fought hard: the entire length of the A9 is now policed by average-speed cameras, past Perth and all the way to the M9. For the next couple of hours, speed management means little more than knocking the cruise control up and down to take account of the different limits. This, I reckon, is the future. Joining the motorway network just south of Dunblane feels like liberation with the promise that it will carry us the 450 miles to Exeter. But the Google Maps navigation, which is running as back-up, now causes alarm, reckoning we’ll reach Land’s End one hour later than the time predicted by the Karoq’s own system. Zooming out reveals no obvious red patches: does it know something we don’t? Crossing the English border just six hours after setting off means we’re ahead of schedule again, and with enough margin to switch to a two-stop strategy. The original plan had been to stop once, but a splash and dash at Southwaite also offers the prospect of a stretch and a fresh coffee. The services deliver on the walk and visit to the gents, but not the much needed Americano, with the Costa franchise closed for stocktaking. Energy drinks will have to do. Midnight arrives just before Preston does and the radio news reports that we’ve officially entered Groundhog Day. It certainly feels that way, the motorway schlep sharing much of the déjà vu of the Bill Murray comedy. Place names change and the mileage on signs counts downwards but, for the most part, the M6 might as well be the repeating background in an old-fashioned cartoon. Another problem with choosing February is soon evident: the numerous sets of roadworks that have sprung up as, I presume, budgets are spent before the end of the financial year. There are five temporary worksites between Preston and Birmingham, most of which reduce the motorway to a single lane, plus a grindingly long stretch of camera-enforced 50mph zone. Brum brings some modest excitement, and confirmation of Google’s omnipotence in spotting a snarl-up: the first bit of the M5 is closed, as is the obvious diversion along the M6, two facts the normally shouty motorway matrix signs remain silent about until we’re practically in the queue. We turn to Waze navigation, which reroutes us on an anthropologically interesting tour of West Bromwich, where many people are still heading home. By the time we rejoin the M5 a couple of junctions down, all available navigation systems now agree we’ll reach Land’s End well before 7am. As traffic levels drop and smart motorway gives way to old-fashioned dumb motorway, so cruising speeds rise. There’s a fair amount of road roar in the Karoq’s cabin at higher velocities, although it’s nothing the audio system can’t make itself heard over. When we get bored of podcasts, discussion turns to speculation on what would be the fastest way to complete the journey we’re on, with closed roads and a free choice of car. I reckon a Bentley Continental GT could do the one-way trip in less than seven hours with enough refuelling tankers and a brave driver. We make our second fuel stop at Taunton and - mercifully - find that the Costa is open and serving, even at 2:30am. 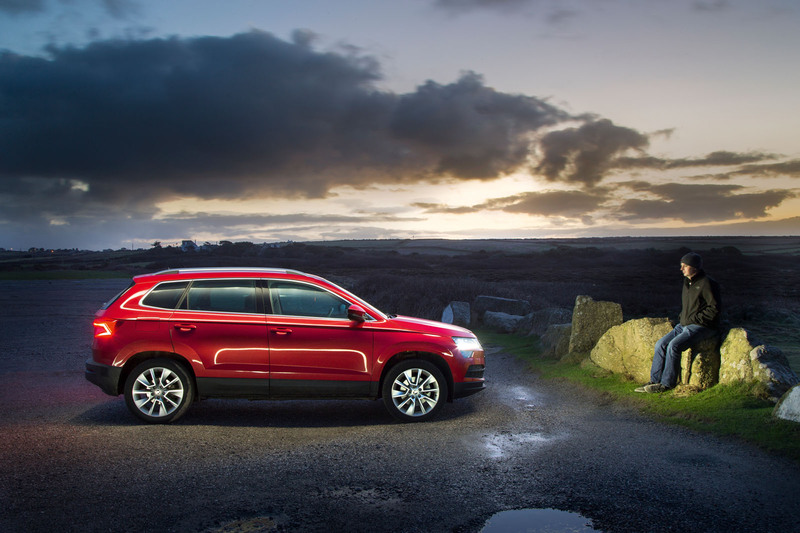 By the time we turn onto the A30 at Exeter, there’s a sense of entering the home stretch, and as the road gets steeper and twistier, the Karoq even gets to experience some steering input again. We’ve entered the truck zone, with many more lorries than cars lumbering west. For the most part, they keep out of our way. The Skoda’s seats deserve particular praise as the clock ticks past 12 hours. There are aches but vastly fewer than there would be sitting in most other cars. The last stretch is like the first: frustratingly slow. Dual carriageway runs out at Camborne and the final leg from Penzance to Sennen is positively twisty. 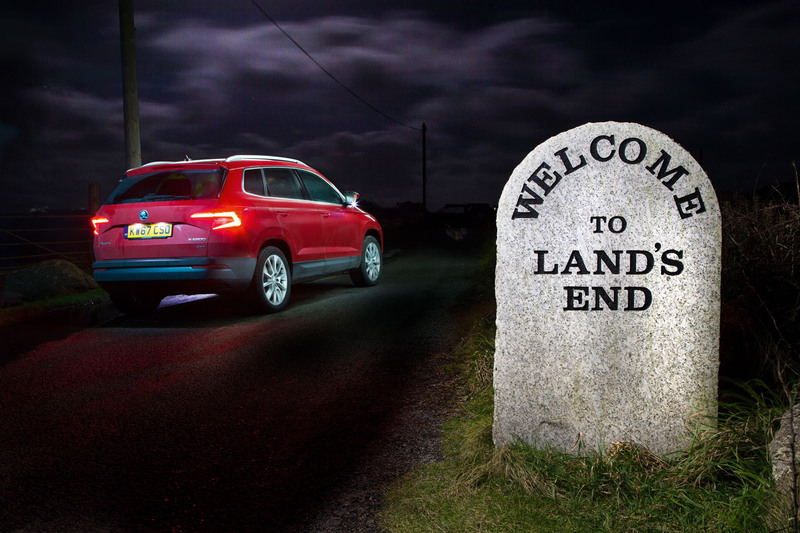 We arrive at Land’s End to a complete absence of cheering crowds and with more than an hour to spare – long enough for a snooze in the corner of the car park before the sky starts to lighten. Like John O’ Groats, it feels like a place that’s accidentally famous for no especially good reason, with spectacular sea views but shuttered retailers dedicated to lightening tourist pockets. Everything is closed, not just until later in the morning but rather until spring arrives. The sun’s light has covered 24,000 miles in the time it has taken us to do 900, but it feels like a victory. Although I wouldn’t claim to be a LEJOG veteran, this is the fourth time I’ve made the trip, but the first run north to south. The Citroën C6 journey in 2007 was run to a far gentler pace over three days. But my first outing, in 1997, was much more frantic. My friend John Dalton wanted to see if it was possible to compress the trip from Land’s End to John O’Groats and then back again into the space of one calendar day using his trusty MG Maestro. I rode along as company, ballast and witness. We left Land’s End at the stroke of midnight and made such good time on our journey north that we reached John O’Groats by late morning, the rapidity of our progress helped by the absence of speed cameras and the Maestro’s anonymity. The return journey was more fraught. Heavy traffic around Birmingham seemed to blow our chances but Dalton’s rally- honed skills were sufficient to get us back to Land’s End at 11:47pm on the same day. The Maestro, which had already covered well over 100,000 miles, didn’t miss a beat. Your Yeti trip around Bhutan was MUCH better. Should you really have your phone navigation wedged in by the gear lever? If you are using your phone maps why not use the Apple CarPlay or Android Auto that the Karoq has? have gone by an editor first.....Yes. Just how many letters can you miss from an article. This one breaks all previous records, a great deal would be corrected by any standard grammar/spell checker. Fired! Touch harsh. A few typos in filler article. I've cycled it twice, once on a tandem bicycle. It can be horrible at times but huge elation at the end. I love the link to the "Skoda Tarraco" article after the third paragraph..... a Freudian slip perhaps?